Landing the ball three feet from the pin after carrying 160 yards over a bunker is the kind of shot seen on Sports Center by tour professionals and the kind of shot that the 20 handicapper never forgets when it happens to them. For the average golfer, shots like these are usually the result of that rare combination when everything comes together in perfect harmony — a relaxed swing, good contact, the right mix between daring and ability, you get the idea. But while these shots may come less frequently than most golfers would like to admit, when they do it reinvigorates the passion for the game. In a world of ever changing technology, most golfers want to harness the latest and greatest equipment in their quest to shoot a better round. But before you scrap your current clubs for the next big thing from TaylorMade or Titlest, pull out your sticks and take a look at the grips, suggests Jimbo Deines of Precision Ski and Golf in Frisco. 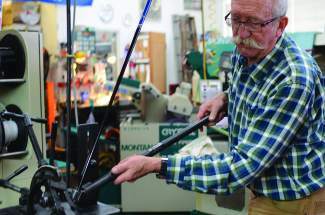 Deines, a custom club fitter with 25 years of experience, says it all starts with the grip. “Hands are different sizes, gloves come in different sizes, yet for many golfers they are playing with a grip that might not be the right size for them,” Deines said. The club fitter equates the grip to a foundation of a house — you need a solid base from which to build a swing. So how do you find the right grip? Deines suggests visiting your local club fitter or pro shop to have your hand measured similar to how you would have your foot measured before buying a pair of shoes. The goal is to find a grip that allows the tips of your fingers to just touch the sole of your hand when holding a club. After determining the right size, it’s all about the texture and material that feels best in your hand. Some grips are very tacky, some very rigid, while others are soft to the touch. Deines suggests finding the one that feels comfortable, is pleasing to the eye and matches the way you intend to play the club. “If you put some effort into getting the equipment right for you, you’ll just plain do better,” Deines said. The club fitter suggests changing grips every couple of years as dirt and grime tends to fill the holes and grooves in grips that provide the secure, tacky feeling when holding a club. He also suggests regularly cleaning grips with a bucket of water and a wire brush to remove any buildup that may develop. Deines said new grips are an easy and inexpensive way to revitalize a club. “I look at it like it’s a snowboard or a ski tune, it’s a great way to start the season off right,” Deines said. The club feels good in your hand, but how do you know that you’re playing with the optimal length club? “Golf is a game that is steeped in tradition. For years and years there were two kinds of clubs, his and hers,” the veteran club fitter said. But he added that as the game has evolved so have the options available to the average golfer to determine the right clubs for their individual game. Deines suggests visiting a professional club fitter for a measurement. Determining the right length can improve ball striking, adding distance and improving control. If you’re looking to try a different club length, but don’t want to fully take the plunge, Deines suggests taking a single club that you know you play well, such as a seven iron and having it lengthened or shortened and playing a few rounds to determine if it’s a better fit. After honing in on the proper length for your build and swing style, the next step is determining what type of shaft matches your game. A popular trend is to switch from steel shafts to graphite as golfers age and their swing speeds decline, said Deines. Graphite can offer a lighter shaft, which allows for improved club head speed. Additionally, graphite shafts are available with varying kick points, which changes the trajectory of a ball when struck. The final step is determining the right angle for the club head relative to your swing plane. Club fitters can bend shafts to match your swing to help ensure that the club head comes through at the appropriate angle at contact, Deines said. He added that ultimately the best way to improve ones play is to iron out any swing issues with a club pro before making any equipment changes. “It’s the constant substitution of technology for technique,” Deines said. Before heading to the links, you may want to take a little time and look at clubs you will be playing. Whether it is a set of tried-and-true blades from a previous decade or a shiny set of improvement irons and hybrids, a few tweaks just might be in order before hitting the next tee box.